Pennants are everywhere lately. 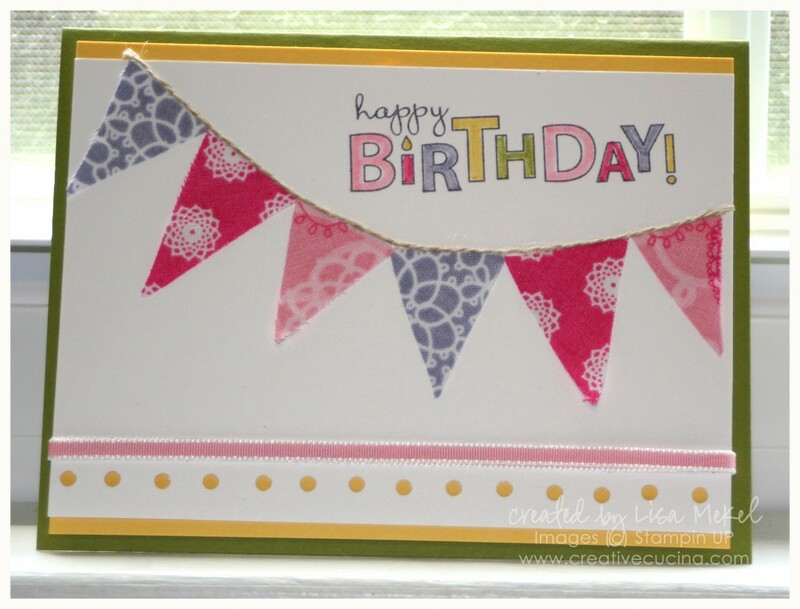 Stampin UP has several birthday stamp sets using pennants, a pennant punch, and I’ve even seen decorating ideas using pennants as cake toppers. Using the Flirtatious Designer Series Fabric, I came up with several projects using Stampin UP fabric on cards. Being that I’m not into sewing (I can sew a button or fix a hole in a sock, but that’s about it), the cards I made are relatively simple. I treated the fabric as paper, cutting it and adhering it just like card stock. 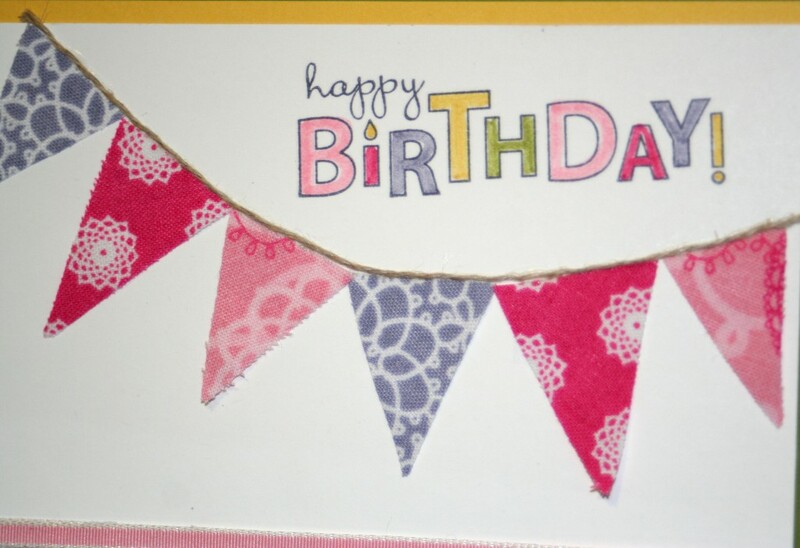 The above card uses pieces of fabric cut into triangles to create a pennant. I used SNAIL adhesive behind the fabric. It’s easier to put the SNAIL onto the card stock first, then adhere the fabric down. After putting the pennants in place, I glued Linen Thread along the tops of the pennants using Mono Multi Adhesive. The stamp is from Bring on the Cake, stamped in Basic Black and colored in with coordinating SU Markers. The base is Old Olive, layered with Daffodil Delight and Whisper White. The ribbon along the bottom is Pretty in Pink 1/8″ Taffeta. 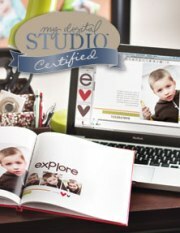 Below the ribbon, I punched holes using the cropadile to expose the yellow card stock underneath. I think this card is teen and girlie, right? I know girlie, but I haven’t been a teenager in a long time, and my daughter’s only 4 so I tried my best to make my niece (who, OMG, is 13 already-when did that happen?) 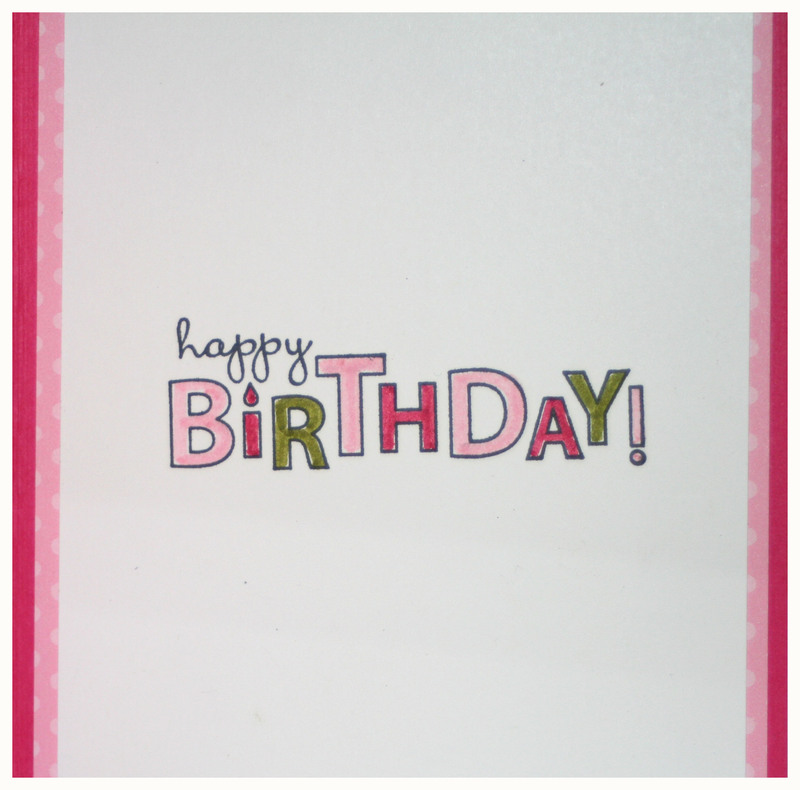 a birthday card she would like. The color combo is Melon Mambo, Old Olive, and Pretty in Pink. It’s a little loud and I’ll admit I went overboard with the bling, but I like it a lot! My husband thinks his niece will like it, and he’s always mesmerized by Crystal Effects, which he calls “glossy stuff”. 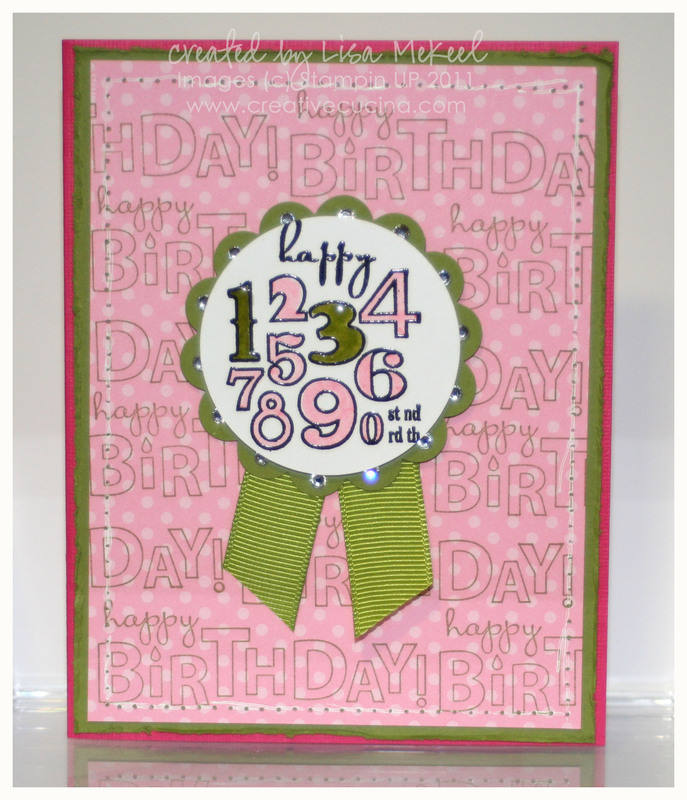 The numbers are from Bring on the Cake stamped in Versamark on Whisper White card stock and Heat Embossed with Black Embossing Powder. I colored in the numbers with Pretty in Pink Marker, and the 1 & 3 with Old Olive Marker. Then, I used Crystal Effects aka “the glossy stuff” to highlight the 13 and give it dimension. I punched out the numbers with a 2 1/4″ Circle Punch and layered it onto Old Olive punched with the 2 3/8″ Scallop Circle Punch. In each scallop, I added Basic Rhinestone Jewels. Behind the scallop circle, I folded Old Olive 5/8″ Grosgrain Ribbon and cut the ends diagonally with my Craft & Paper Scissors (which cut ribbon like a dream). That is attached to the card with stampin dimensionals. 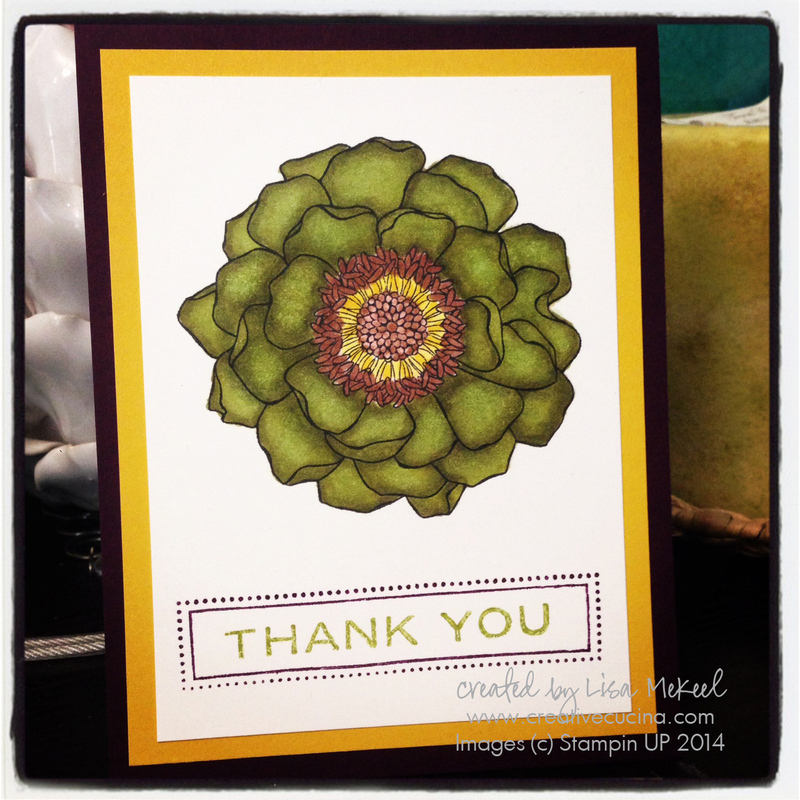 The card base is Melon Mambo textured card stock layered with Old Olive. 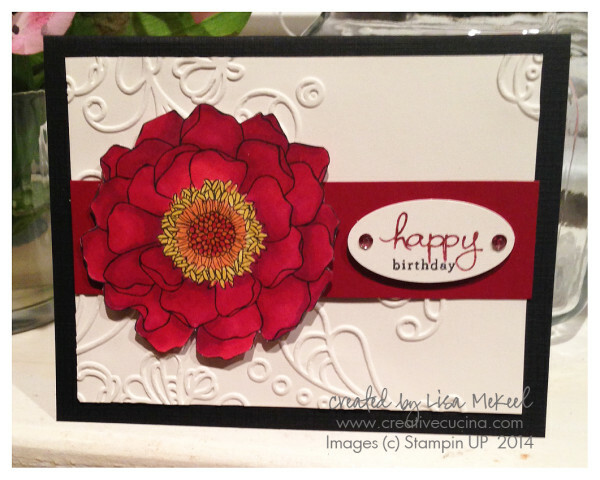 I used the Cutter Kit to distress the edges of the card stock. 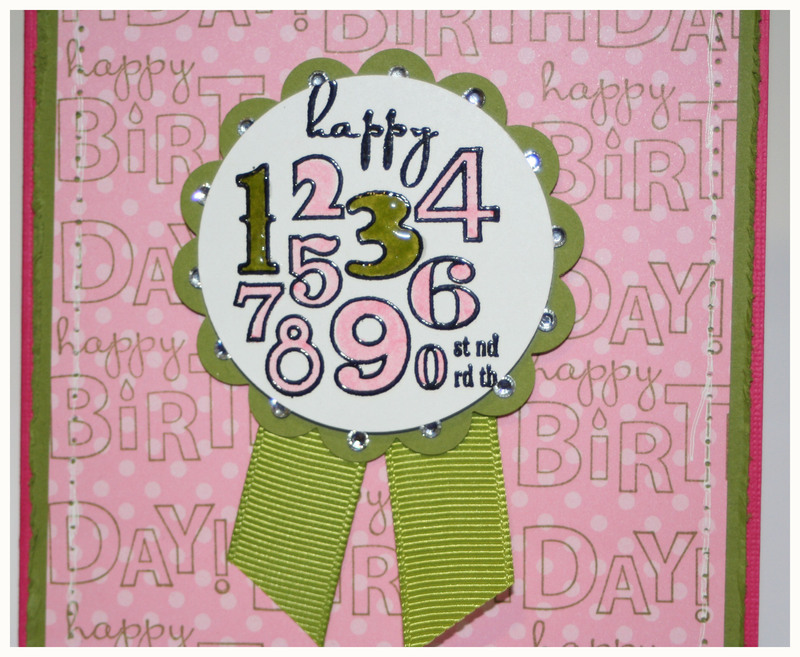 Next, I used pink polka dot paper from the Love Patterns DSP and stamped it with “happy birthday” from Bring on the Cake in Old Olive ink. To finish it off, I decided to paper pierce around the edges and add faux stitching with the Signo White Gel Pen. Inside, I used some more of the Love Patterns DSP, layered with Whisper White card stock. I stamped the sentiment in Basic Black ink and then colored in the letters with Melon Mambo, Pretty in Pink, and Old Olive Marker.